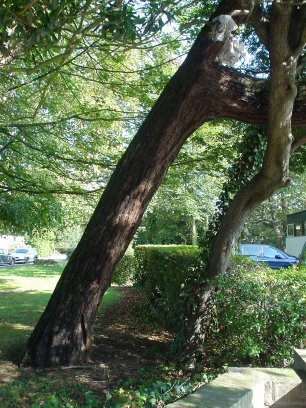 At the back of the Laurels along Main Road is a young Giant Redwood of around twenty-five to thirty years old. Perhaps it was planted for the Queen's Jubilee in 1977. 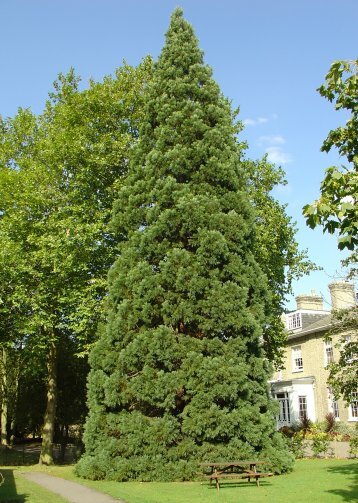 At the front of the grounds near to the library is another, very sorry looking Wellingtonia that is struggling to compete with the other trees that crowd it on all sides. 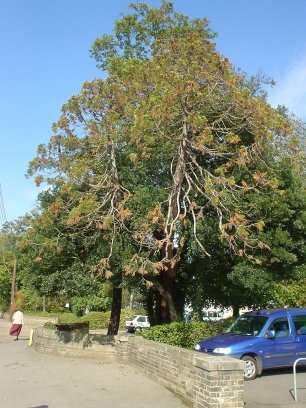 It leans at almost a fortyfive degree angle and what sparse foliage it has is mostly brown and dying. It appears to be about the same age but has fared much worse than its healthy companion. Perhaps a lesson here in where (and where not) to plant a Giant Redwood.